The Razer Blade Pro is thin, but is it gaming nirvana? The Razer Blade Pro is a powerful gaming laptop, with high-end components, a lovely 1080p screen, and a fancy touch-screen trackpad, but is it any good? The Razer Blade Pro is a high-end gaming laptop that's thinner and lighter than most of its 17-inch competitors. 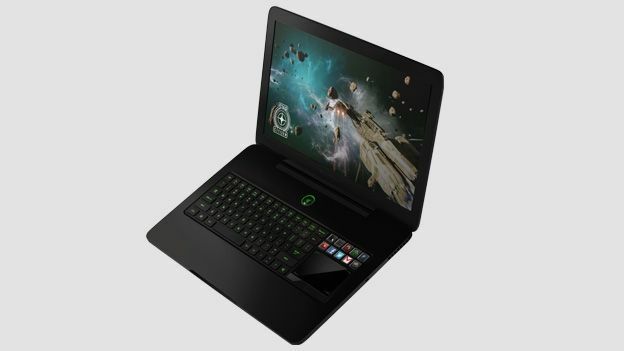 Take the new Alienware 17, for instance - the Razer Blade Pro is half as thin and over a kilogram lighter. And while its noticeable slimmer than its competition, it hasn't skimped where it matters to games in terms of specs. It rocks an Intel Core i7 quad-core processor, the latest Nvidia GTX 765M graphics, and 8GB RAM, which make it a great performer for games as well as video and photo editing. Combined with a classy screen, a generally understated style and a trackpad that doubles as a second display, the Razer Blade Pro is an attractive, if expensive pro-level gaming laptop. Bigger than its sibling - the Razer Blade - the Razer Blade Pro is a 17.3-inch laptop that's 427mm wide, 277mm deep and 22.4mm tall. It's certainly big and bulky, but in comparison to the similarly specced Alienware 17 laptop, it's half as thin and over a kilogram lighter. It's also much sleeker than most gaming laptops, with a clean black aluminium unibody design, a low-profile keyboard, and a generally solid build quality. It's more Apple than Alienware, although Razer lost its nerve with the gaudy bright green keyboard, a feature that no gaming laptop maker seems to be able to resist. The Blade Pro has everything you'd reasonably expect from a high-end, pro-level laptop, including three USB 3.0 ports, Ethernet, HDMI out, a headphone socket and a Kensington lock port. The only thing we'd really expect that's missing is an SD card reader, while some may bemoan the lack of an optical drive, even though it clearly helped keep the unit's size and weight down. The 150W power brick is relatively small, but it doesn't attach to the computer magnetically, so it could be a tripping hazard. Razer's wireless technology is also lagging behind, quite literally, at 802.11n speed rather than the 802.11ac standard that's becoming common in late-2013. The basic Blade Pro comes with a 128GB SSD drive for storage, but our review model came with the 256GB drive option, which costs $200 extra. We'd definitely recommend the upgrade or buying an external drive for storing games, as most titles weigh in at around 10-20GB these days, while Max Payne 3 is 29GB. The Blade Pro's webcam is 2.0 megapixel, which produces clear images on Skype. However, one strange feature of our review model was that it produced a lot of interference through the headphones whenever the unit was plugged into the mains. The Razer Blade Pro's 1,920 x 1,080 pixel screen is lovely, with great detail, a wide viewing angle and ample brightness. Games look gorgeous running at 1080p native resolution, and most titles ran well at mid-to-high graphical settings. The screen offers loads of real estate for working, which makes it's especially suited to video and photo editing. There aren't really any laptops in the PC market that will better this screen, although the Macbook Pro with Retina Display offers a much higher 2,880 x 1,800 resolution, albeit it at a smaller screen size of 15-inches. Razer's keyboard is nicely designed, with keys that are durable and satisfying to type on. One small concern is that Razer chose style over function with the bespoke Razer-style font, which isnít as clear as most keyboard fonts at first-glance. The headline control feature has to be the Razer Switchblade trackpad, which is less of a standard trackpad and more of a Windows mobile phone embedded in the case. You can use it like a standard trackpad, although as it's made of glass, your fingers will encounter a little more friction than on most trackpads. The Switchblade also doubles as a second screen, with 10 keys that can quickly pull up websites like Twitter, Facebook or Gmail so you can do things like Tweet without interrupting your game. However, the Switchblade trackpad is located to the right of the keyboard, rather than the standard positioning underneath the keyboard, which takes some getting used to. And while the Switchblade is cool, you'll definitely want to connect a mouse or gamepad when playing games. The Blade Pro is designed primarily to play games, so it packs high-end hardware including an Intel Core i7-4700HQ quad-core processor, 8GB of RAM and a GTX 765M graphics chip. This means you can play most games, like Tomb Raider and Bioshock Infinite, in native 1080p resolution at mid-to-high settings. Crysis 3, the current benchmark in PC gaming, runs at slightly lower settings, but still runs at a smooth 30 frames per second. Those specifications also mean the Blade Pro loads quickly, can support many applications simultaneously, and is an ample photo and video editing platform as well. The battery is decent, if not great - you get around five hours in general use, but that drops to an hour for gaming. If portability isn't a major concern for you, it's worth noting that you can get quite a bit more bang for your buck away from the Razer Edge Pro. The Alienware 17 laptop at the same $2,299 price point as the basic Blade Pro offers double the RAM at 16GB, a much larger 750GB HDD/64GB SSD combo drive, a more advanced Intel Core i7-4800HQ processor, a faster Nvidia GTX 770M graphics card with more RAM (3GB), and a Blu-Ray drive. The trade off is that the Alienware is a good deal thicker and heavier than the Blade Pro. The Razer Blade Pro is a great gaming laptop, offering a mix of performance, style and quality at a premium price. It'll handle every game you throw at it right now with aplomb, producing gorgeous visuals on its big 1080p 17-inch screen. Our few complaints are minor, such as the placement of the trackpad, the lack of 802.11ac networking, and the omission of a card reader. There are more powerful gaming laptops available at this price, but none that are as thin, light or beautifully designed as the Razer Edge Pro.